Principals in the United Airlines effort to introduce aviation biofuel into its regular operations said it was a necessary step to advancing the fledgling alternative jet fuel industry. 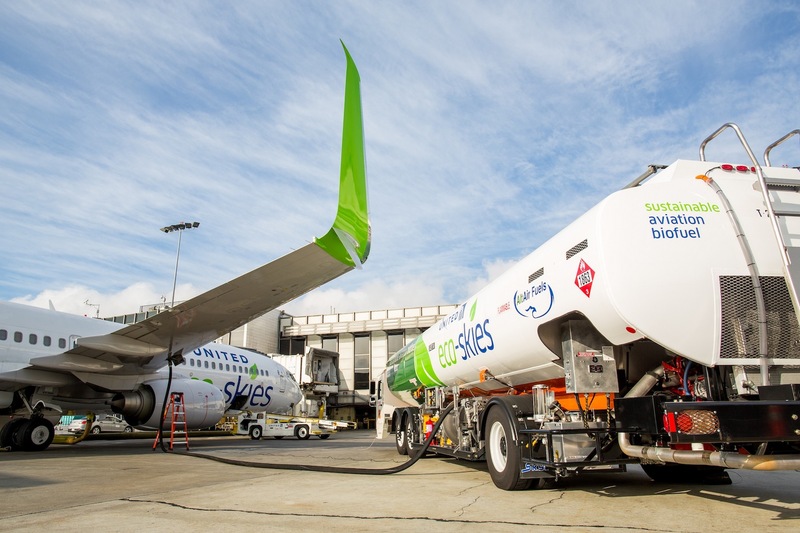 United started using “commercial-scale” volumes of biofuel at Los Angeles International Airport (LAX) earlier this year in what it described as an historic development. Foster-Rice and executives with fuel logistics company World Fuel Services and refiner AltAir Fuels recounted the effort to supply LAX with “sustainable” aviation biofuel derived from non-edible natural oils and agricultural waste during the recent biennial general meeting of the Commercial Aviation Alternative Fuels Initiative (CAAFI) in Washington, D.C. During the meeting, CAAFI executive director Steve Csonka reported that 22 world airlines have now performed more than 2,500 alternative-fuel demonstration flights—so many that he has stopped counting. Continental Airlines—now part of United—became the first U.S. carrier to perform a biofuel demonstration flight in 2009. United conducted the first revenue flight using an algae-derived fuel as part of a mixture in 2011. The Chicago-based carrier and AltAir, which uses Honeywell UOP process technology to refine feedstocks into renewable fuels at a facility in Paramount, Calif., reached agreement in 2014 on a multi-year supply contract—AltAir’s first with a commercial airline. In June 2015, United announced a $30 million equity investment in Fulcrum BioEnergy, of Pleasanton, Calif., and a 10-year agreement to buy 90 million gallons of sustainable aviation fuel per year from the company, which converts municipal solid waste into biofuel. United and Fulcrum also agreed to co-develop up to five refineries near the airline’s hub airports, with the first expected to begin operating in 2019. With AltAir, United has agreed to purchase up to 15 million gallons of biofuel over three years. It started using the drop-in alternative fuel on regularly scheduled flights on March 11. The biofuel is delivered by truck from the Paramount refinery, which is located 16 miles east of LAX. For the first couple of weeks, it was pumped directly into aircraft at a blend ratio of 30 percent biofuel to 70 percent traditional fuel. But the direct-to-airplane delivery was only “promotional in nature, to raise awareness,” said Foster-Rice. Now the biofuel comes from the “hydrant,” or from the airport’s fuel storage infrastructure, and is treated the same as traditional fuel. “Our goal is to…no longer ‘boutique’ and treat biofuels separately because it’s driving a lot of industry costs we don’t need,” Foster-Rice explained. “Just like how we purchase traditional fuel from, say, Chevron—we buy [biofuel] and it gets delivered into the tanks at the airport and then ultimately that’s mixed together” with fuel from other suppliers. World Fuel Services has provided biofuel logistics and delivery services to manufacturer Gulfstream Aerospace in Savannah, Ga., as well as to KLM and United at the Los Angeles airport. At LAX, the company is also converting a ground fuel facility to supply biodiesel for ground equipment, said Robert Sturtz, vice president of business development. The first commercial biofuel deliveries to United were not problem-free, he said. “Even though we were using known technology, the refinery had hiccups, the refinery had delays” related to equipment, Sturtz recounted. There were also fuel contamination issues with the first delivery trucks World Fuel Services arranged. “Even though we make tens of thousands of truck deliveries every day, the start-up at LAX resulted in quality and contamination problems on the first two deliveries that we tried to make,” he said.